This is the first English translation of the seminal book by Katharina Reiß and Hans Vermeer, Grundlegung einer allgemeinen Translationstheorie, first published in 1984. 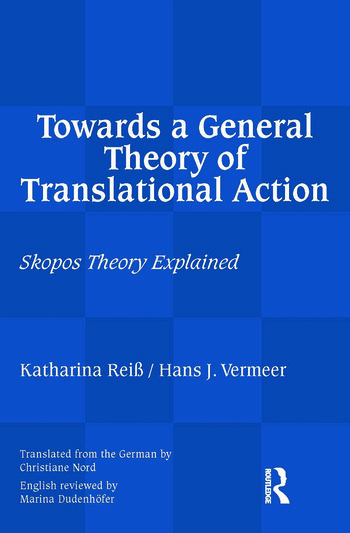 The first part of the book was written by Vermeer and explains the theoretical foundations and basic principles of skopos theory as a general theory of translation and interpreting or ‘translational action’, whereas the second part, penned by Katharina Reiß, seeks to integrate her text-typological approach, first presented in 1971, as a ‘specific theory’ that focuses on those cases in which the skopos requires equivalence of functions between the source and target texts. Almost 30 years after it first appeared, this key publication is now finally accessible to the next generations of translation scholars. In her translation, Christiane Nord attempts to put skopos theory and her own concept of ‘function plus loyalty’ to the test, by producing a comprehensible, acceptable text for a rather heterogeneous audience of English-speaking students and scholars all over the world, at the same time as acting as a loyal intermediary for the authors, to whom she feels deeply indebted as a former student and colleague.